Within the Group, in recent years increasing importance has been given to mobility management, developing and implementing strategies to ensure that personnel and cargo are transported efficiently and sustainably. Our main objective in this area is to reduce employee travel as far as possible, above all reducing the use of private vehicles and increasing the use of public transport in order to decrease air pollution in cities. In all countries, we seek to assign mobility management to a dedicated person, the mobility or travel manager, who is responsible for planning sustainability initiatives, improving home/work commutes, maintaining relations on these issues with the municipal authorities and, sometimes, also managing the corporate fleet or defining contractual conditions with transportation service providers. In all countries there are travel policies which prioritise the use of public transport and, more specifically, promote the use of the most environmentallyfriendly types of transport, as well as car policies which establish the maximum limits of carbon dioxide (CO2) emissions for corporate cars. 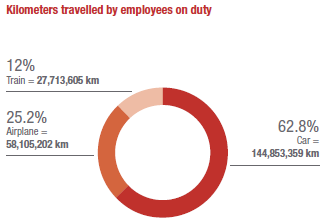 In 2013 the work-related journeys by car, air and train made by the Group employees amounted to a total of 230,672,166 km. To reduce travel, shuttle services connecting the offices with train stations or airports have been introduced where possible. In Italy an application was created by the HR department where employees can offer/take advantage of lifts by colleagues that make the same journey. In all countries, the corporate policies promote the use of trains, even though the range of different methods of transport available for work-related journeys is linked to the location of the Group sites in the country, as well as the quality of the existing rail and air connections. In Austria train journeys are environmentallyfriendly as the majority of the energy used by the Austrian railway network is hydroelectric. In Germany, for a number of years now we have had an agreement with Deutsche Bahn (the German national railway company) whereby all journeys made by train by employees on duty are carbon neutral, meaning the emissions are offset through environmentally-sustainable initiatives. In recent years Generali has also established agreements with the Postal Service in Austria and Deutsche Post/DHL in Germany which involve the offsetting of CO2 emissions relating to each package shipped through the purchase of certificates that use environmental initiatives to neutralise these emissions. In all countries there are incentives for video and teleconference systems, which make it possible to reduce the work-related journeys by Group employees and, at the same time, provide a visual connection. In 2013, the number of videoconference calls totalled 38,578, an increase of 17.3% compared to 2012. Videoconference calls can also be made from individual workstations in France, Germany and, in the last few months now, also in Italy. In the last few years, more environmentally-sustainable vehicles have been introduced to the corporate fleet in France: an electric car is used for transporting packages and post between the three buildings located in Saint-Denis. A hybrid car has also been purchased for a member of the company’s Top Management. We also try to make home/work mobility more environmentally sustainable by promoting the use of bicycles or covering part of the costs of annual tickets for public transport in some countries/ companies. In Italy, Austria and France, tele-expertise systems for claims remain in place, which limit the number of car journeys by assessors. In several countries, telecommuting has also been possible for several years now: in Austria, France, Germany and Switzerland some Group employees have the opportunity of working from home, reducing both home/work journeys, and trips to clients, with a consequent reduction in greenhouse gas emissions.